Webb signed his exclusive-rights tender with the Jets on Thursday. Analysis: Webb spent much of the 2018 season on the Jets's practice squad. He currently appears in line to be the team's third option at quarterback in 2019 behind Sam Darnold and Trevor Siemian, but a quality camp could promote him to the top backup position. Webb, an exclusive-rights free agent, has been tendered by the Jets, Randy Lange of the team's official site reports. Analysis: With Josh McCown set to become an unrestricted free agent, it appears Webb will enter the offseason as the tentative backup to Sam Darnold. It's possible that could change depending on what the Jets do in the draft and free agency. 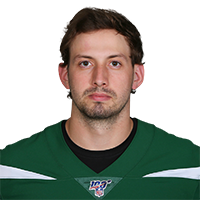 The Jets signed Webb off their practice squad Saturday, Field Yates of ESPN reports. Analysis: With Sam Darnold (foot) doubtful to play Sunday against the Bills, Webb is expected to step in as the backup to Josh McCown, who will make his first start of the 2018 season. Assuming Darnold is good to go after the Jets' Week 11 bye, it's possible that Webb will lose his spot on the 53-man roster. Webb signed with the Jets' practice squad Tuesday. Analysis: It was a surprise when the Giants cut Webb after they picked him in the third round of the 2017 NFL Draft. He was an solid collegiate talent, completing 62 percent of his passes for 4,295 yards, 37 touchdowns and 12 interceptions his senior season at California. The Jets may look to develop Webb into Sam Darnold's future backup. Webb was waived by the Giants on Sunday, Jordan Raanan of ESPN.com reports. Analysis: Webb was a third-round draft pick just one year ago, but he wasn't taken by the current regime in New York. The Giants will open the season with Alex Tanney and fourth-round rookie Kyle Lauletta behind Eli Manning. Webb appears to have beaten out Kyle Lauletta for the Giants' No. 2 quarterback job, Jordan Raanan of ESPN.com reports. Analysis: Webb was held out of Thursday's preseason finale against New England, allowing Lauletta to make the start and get all the playing time in the first half. The rookie fourth-round pick failed to make one last push for the No. 2 job, completing just eight of 19 passes for 118 yards with a touchdown and two interceptions. Webb played the entire first half Friday night against the Lions and completed 14 of 20 attempts for 140 yards and a touchdown. Analysis: It was a strong showing in his battle to supplant rookie Kyle Lauletta, though Lauletta, a product of the current management regime, might still be the favorite for the role. Webb may face competition from rookie fourth-round pick Kyle Lauletta for the No. 2 quarterback role, Paul Schwartz of The New York Post reports. 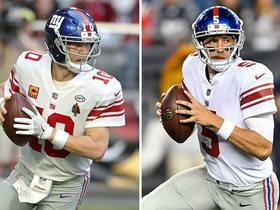 Analysis: With Eli Manning in the twilight of his career, the Giants presumably will carry three quarterbacks, hoping that either Webb or Lauletta eventually proves to be their signal-caller of the future. A third-round pick last year, Webb completed 18 of 34 passes for 190 yards during the preseason and didn't take any snaps in the regular season. He was drafted by Jerry Reese and Ben McAdoo, whereas Lauletta was picked by the new regime, led by general manger Dave Gettleman and head coach Pat Shurmur. Webb will have a chance to impress new head coach Pat Shurmur in the buildup to the NFL Draft, Paul Schwartz of the New York Post reports. "The advantage we will have is we'll have two weeks of training where we can't go on the field, it's just in the meeting room, and we're gonna get that extra minicamp, which will be right up to the draft, so it will be a great way for Davis to sorta showcase what he can do," Shurmur said Tuesday. Webb, last year's third-round pick, didn't throw a single pass during his rookie season. Analysis: Geno Smith got one start when Ben McAdoo benched Eli Manning, but Manning got his job back, and the Giants never turned to Webb. Webb should be in the mix for a backup spot in 2018, but it's hard to see him competing for the starting job with no experience. Giants interim head coach Steve Spagnuolo said Wednesday that Webb will serve as starting quarterback Eli Manning's backup Sunday versus the Redskins, replacing Geno Smith, Paul Schwartz of the New York Post reports. However, Spagnuolo noted "there's no guarantees" Webb will make an appearance, per Schwartz. Analysis: Earlier Wednesday, Ian Rapoport of NFL Network leaked this news, only to have it confirmed by Spagnuolo during media availability. The development has been in the works for a few weeks at this point, as Webb has increased his practice reps with the first-team offense slowly but surely. Despite his elevation in the pecking order, Webb's lack of guaranteed reps in Week 17 is probably enough to keep him off the fantasy radar, even in active season-long formats that start two quarterbacks. 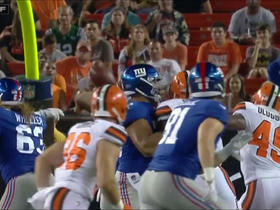 Webb is expected to be the Giants' backup quarterback Sunday versus the Redskins, Ian Rapoport of NFL Network reports. Analysis: Webb has increased his reps with the first-team offense the past few weeks, seemingly in preparation for an appearance before the conclusion of his rookie campaign. Even so, he didn't serve as the backup QB when Eli Manning vacated his starting spot to Geno Smith in Week 13. With active status likely this weekend, there's a good chance Webb takes the field for the first time as a professional, especially with the Giants one loss away from locking up the No. 2 pick in the 2018 NFL Draft. Webb has been taking some snaps with the Giants' first-team offense during practice this week, Dan Salomone of the Giants' official site reports. "We're amping [Webb] up a little bit," interim head coach Steve Spagnuolo said. "He's always preparing like he's going to be a two or maybe even play in the games. So the preparation is the same, but we just wanted to make sure we got him some reps on the field." Giants interim head coach Steve Spagnuolo said Wednesday that Webb will remain inactive as the team's No. 3 quarterback Week 15 against the Eagles, Dan Duggan of NJ.com reports. Webb is expected to remain the Giants' No. 3 quarterback leading up to Sunday's game against the Cowboys and is thus likely to be inactive for the contest, Tom Rock of Newsday reports. Webb is expected to be inactive for Sunday's game against the Raiders, but should receive 2-to-3 starts before the 2017 season ends, Ian Rapoport of NFL Network reports. 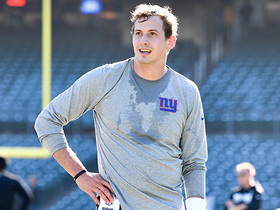 Webb's practice routine hasn't yet changed, but Giants head coach Ben McAdoo hinted that it will in the coming weeks, Ralph Vacchiano of SportsNet New York reports. Webb is expected to receive a trial as the Giants' starting quarterback before the season ends, Jordan Raanan of ESPN.com reports. "Over the last five games, we will take a look at Geno [Smith], and we will also give Davis an opportunity," Giants head coach Ben McAdoo said Tuesday after announcing that Eli Manning would be removed from the starting role. NFL Network's Judy Battista talks about the Giants plans for QB Davis Webb during the team's minicamp. NFL Network's DeMarcus Ware and Terrell Davis discuss what is next for the New York Giants at Quarterback next season. 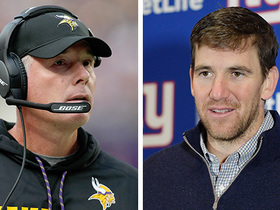 NFL Network's Kimberly Jones gives insight into why the New York Giants would decide to go with Minnesota Vikings offensive coordinator Pat Shurmur as their next head coach. NFL Network Insider Ian Rapoport gives an update on the New York Giants quarterback situation heading into Sunday. 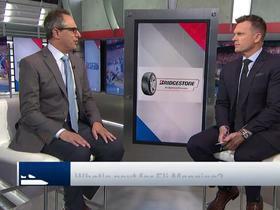 NFL Network's Michael Silver talks about Eli Manning and how he's helping the development of the young quarterbacks on the Giants' roster. 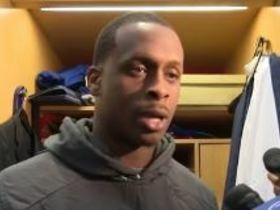 NFL Network Insider Ian Rapoport evaluates New York Giants quarterbacks Geno Smith and Davis Webb. 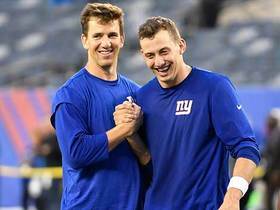 New York Giants QBs Geno Smith and Davis Webb react to Eli Manning benching. 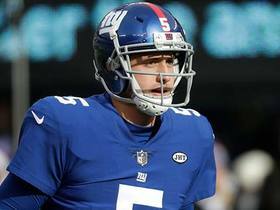 NFL Media's Kimberly Jones breaks down the QB depth chart for the New York Giants in Week 13.